Recipe requestd by Tan & Lay... enjoy! Happy Cooking! 1. Boil 1 whole chicken & garlic in 1L water till chicken just cooked. 2. Take out chicken, debone and shred the meat. Seasoned the shredded chicken meat with soya sauce and sesame oil. Set aside as porridge topping. 3. Place all the chicken bones back to the pot of water to get chicken stock. 1. Wash the rice and add in chicken stock, abalone broth & dried scallop. Start cooking at high fire reduce to low/medium fire once it's start boiling. 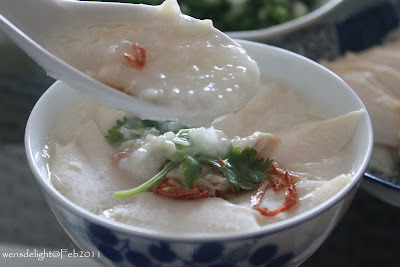 Check the congee consistency by stirring occasionally to prevent it from burning. 2. Add boiling water when necessary. Simmer till it becomes congee. 3. Add seasoning to taste. 4. Served congee with sliced abalone, shredded chicken & garnishing.